Air101: Hawaiian reports its financial results for the fourth quarter and full year 2018. Hawaiian reports its financial results for the fourth quarter and full year 2018. 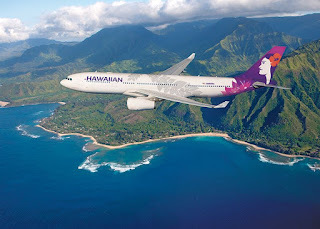 Hawaiian Airlines today reported its financial results for the fourth quarter and full year 2018, which shows the carrier performed well in the face of higher fuel costs, delays in aircraft delivery, bad weather and increased competition. "Hawaiian delivered another year of strong financial results in 2018, with an adjusted pre-tax margin in the top tier of industry performance," said Peter Ingram, Hawaiian Airlines president and CEO. "Undaunted by higher fuel prices, elevated competitive capacity, aircraft delivery delays and severe weather events, our employees once again demonstrated why Hawaiian is the carrier of choice to Hawai'i. 2019 will be an important year for Hawaiian. Successfully dealing with all of 2018's twists and turns gives me tremendous confidence in our ability to sustain and build upon our achievements in the years ahead."